Kate was looking for a seaside feel with natural elements. 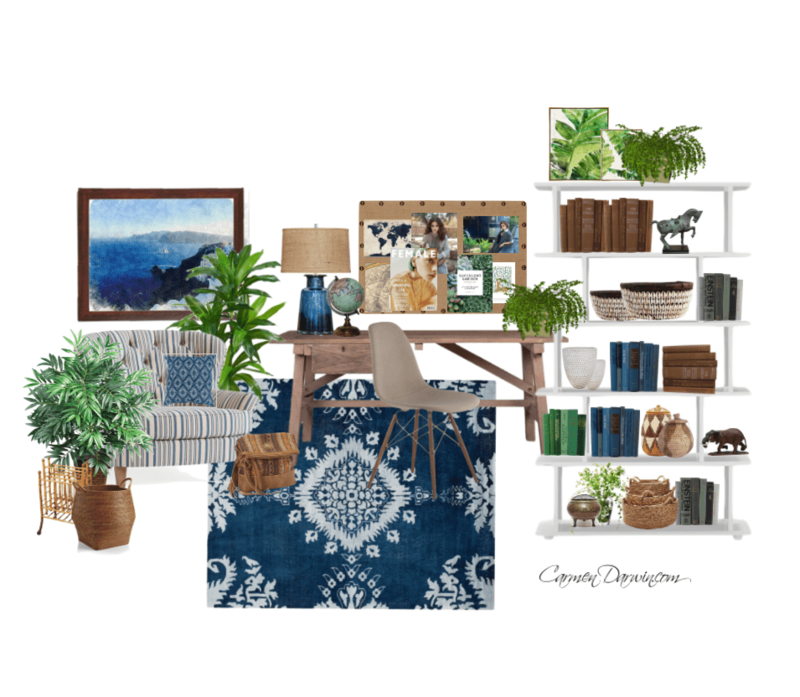 Being a lover of blues and neutrals I created this concept board to show her exactly how to take her workspace to the next level. 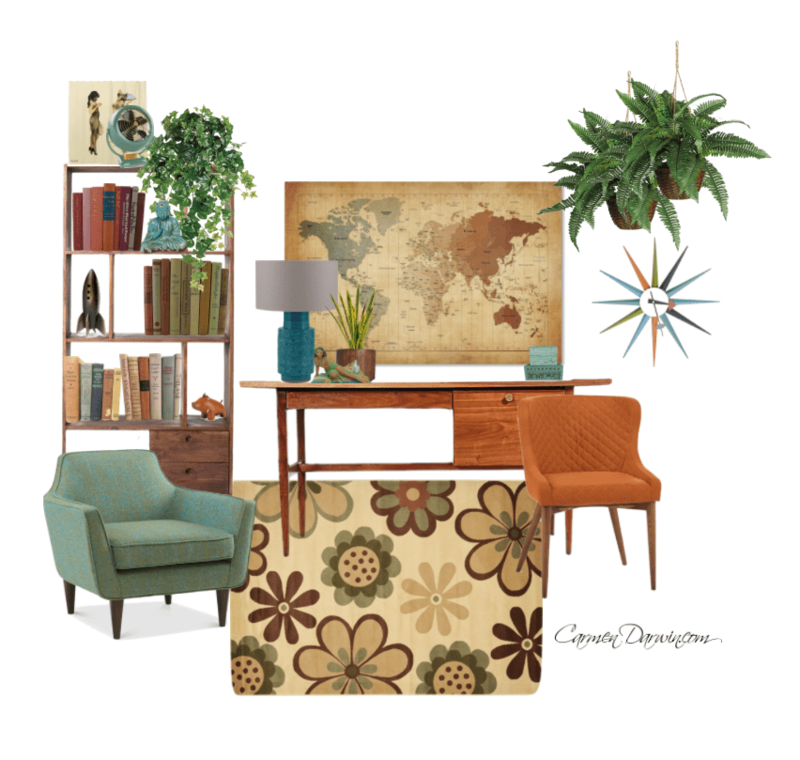 Susie was wanting a look with a vibrant colour pallette and a mix of handmade items. 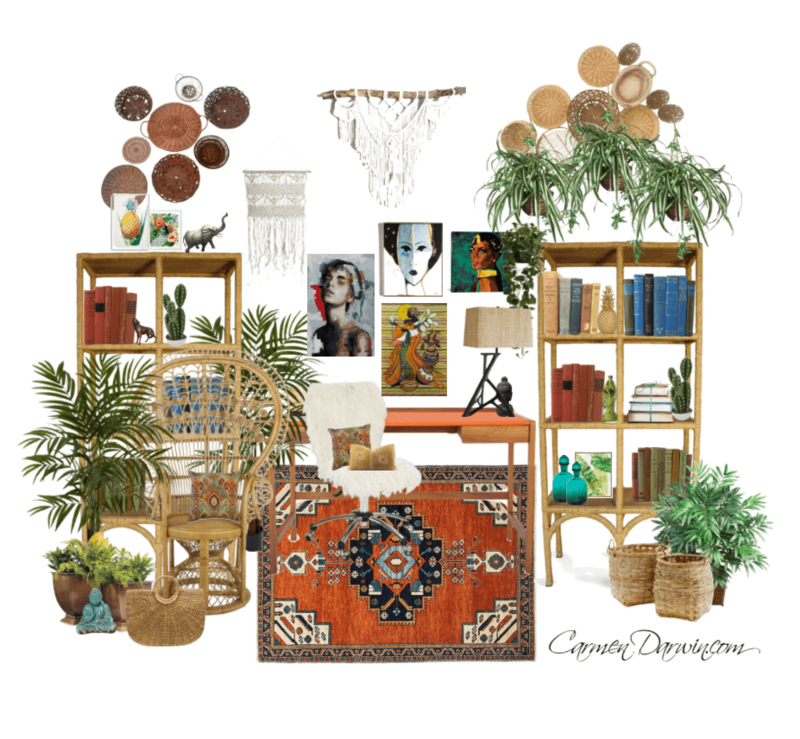 She’s attracted to natural decor and is a bit of a bohemian at heart, so I created a moodboard showing her how to mix colours and objects in a style that she loves. Using this board she was able to shop for what she needed and start transforming her space. 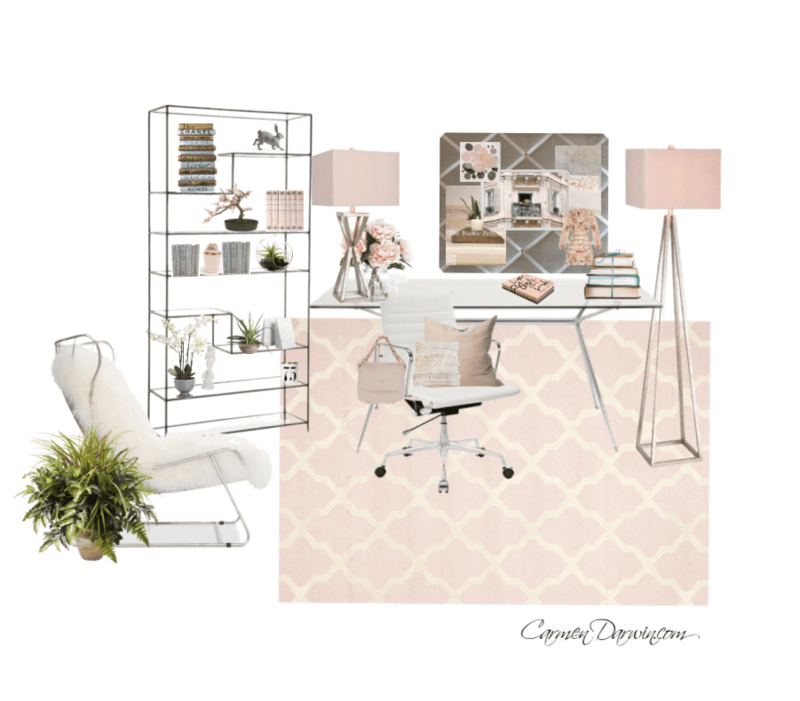 Antionette was looking for a soft but sophisticated look for her workspace. As she works in the cosmetics industry and her brand colours are soft pinks and whites, I decided to extend her brand colours into her workspace. She was delighted with the idea here and with this and her shopping list she was ready to take action and finally get her workspace looking professional and stylish. 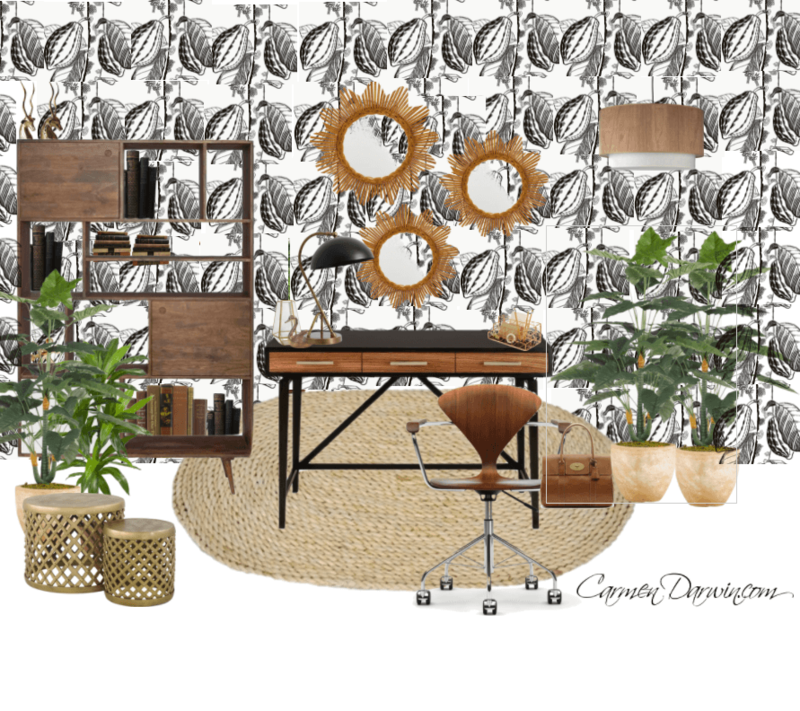 Lou was has a classic style home and wanted to keep the theme running into her home workspace. She likes a bit of glamour but wanted to keep her colours classic and timeless. 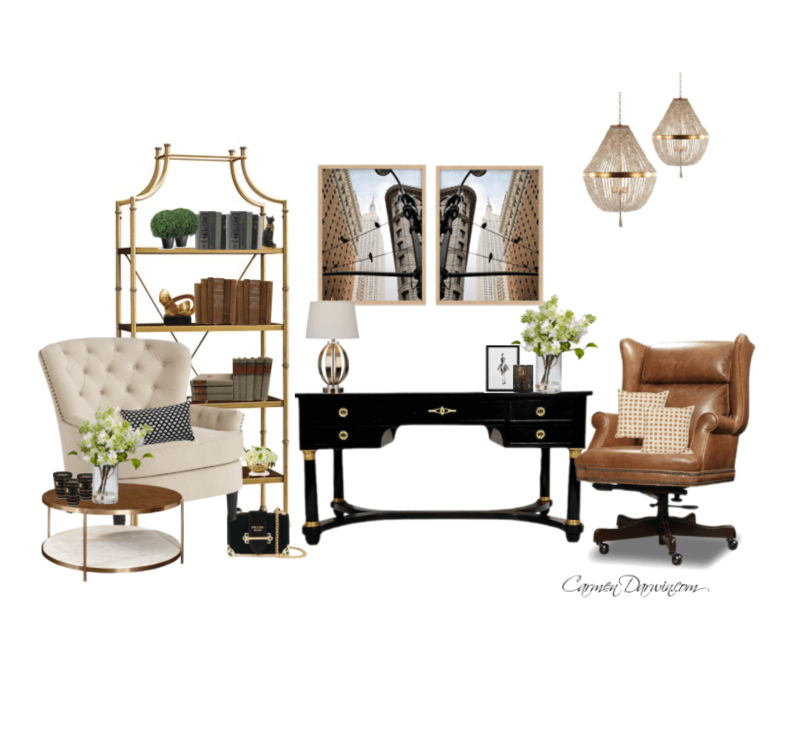 Due to having clients visit her home office she wanted it to feel luxurious and stylish. She was able to take this moodboard as her guide and create a space that she enjoys being in each day. Kylie was a fan of the retro style but was unsure of the colours to choose and what types of furniture to source. She was uncomfortable with having too many brightly contrasting colours, so I created this look with a hint of bold orange but mixed it with some soft blue/greens and cream tones. She felt confident that she could source items similar to these and transform her space quite easily. Michelle had always liked an industrial style of design and loved blacks and timbers. 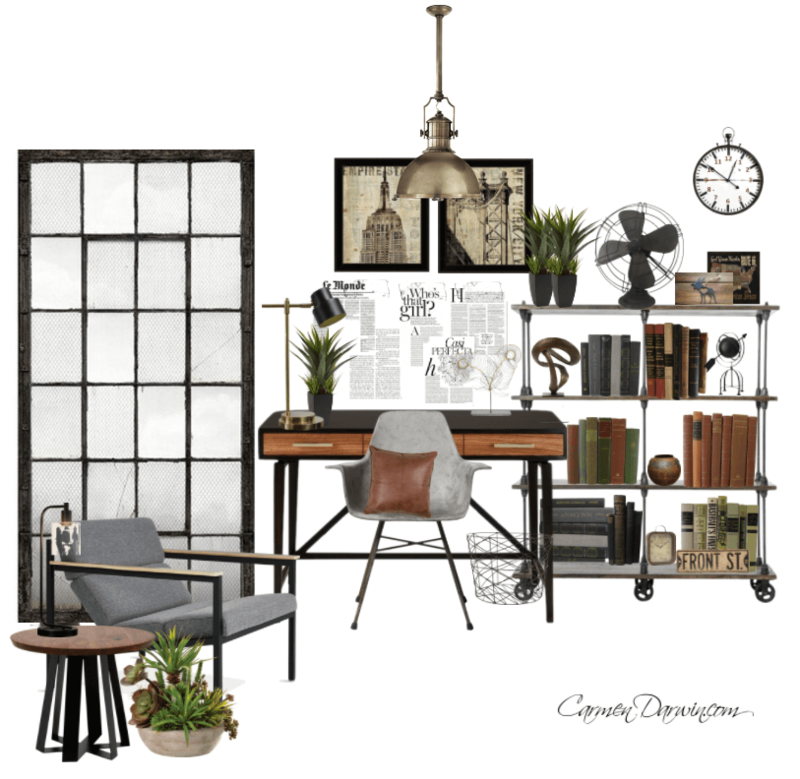 Being an avid collector of old things and with the idea of repurposing used items to create a new workspace on a budget, I designed a space that is simple yet functional and a room that has a bit of an edge to it. This kind of design is simple to achieve and once she had this blueprint she was excited to get started on it. Jane had very ugly looking walls which she had always hated. We discussed the idea of using wallpaper to disguise the old wall and inject a bit of a wow factor into her space. Jude was all for it and couldn’t wait to transform her room with this black, white and timber theme. With a hint of gold to glam it up, she was thrilled with the concept and ready to move forward on the transformation. Elizabeth needed a quick makeover for her space. She already had the white walls and she wanted a colour concept and furnishing ideas for her space and wanted furniture that was not hard to find. 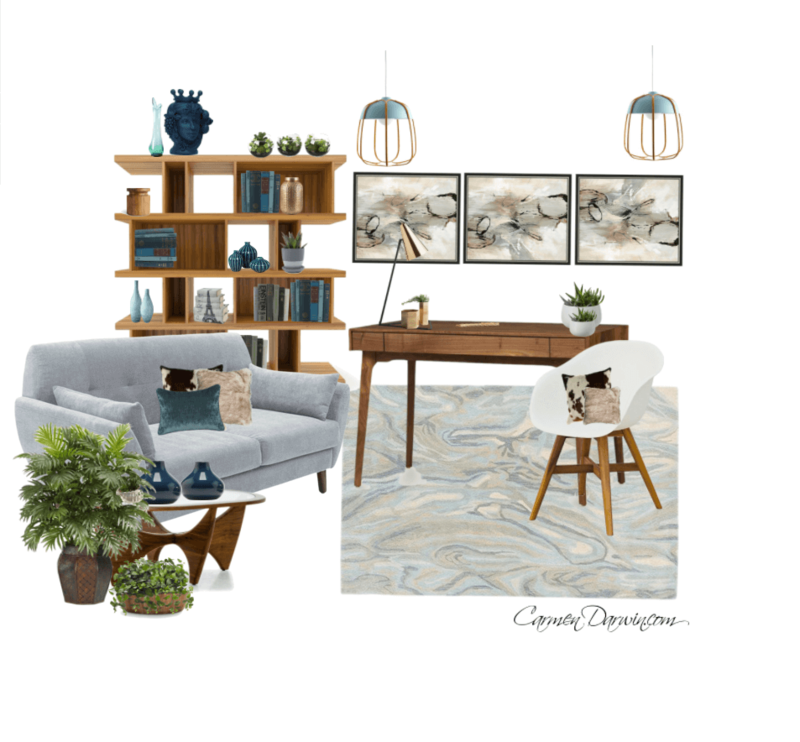 I created this moodboard with a mix of grey, blues and creams. With the list that I provided her she was able to start shopping straight away and make a change in quite a short space of time. My client was building a new student accommodation project here in Brisbane Australia, close to the QUT campus. 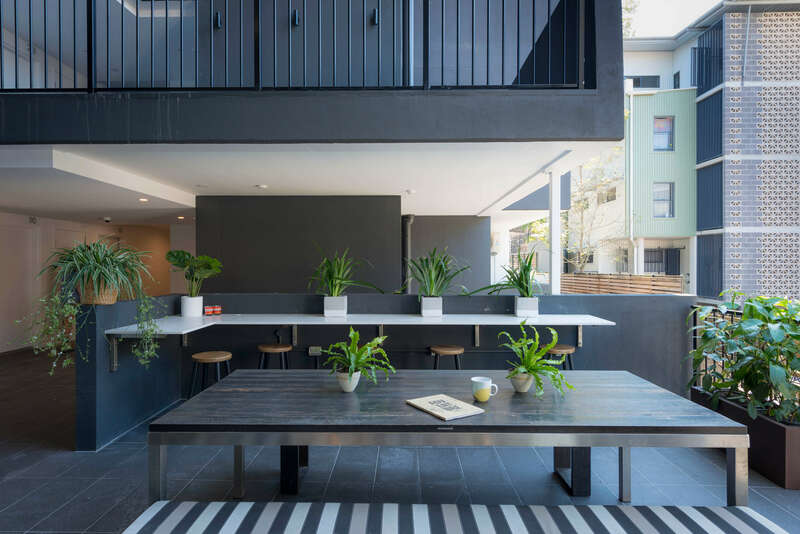 He wanted me to design the student common room space at Unilodge in Brisbane which could be used as a living space as well as a workspace for the students. My brief was to make the spaces exciting and special for the students who would occupy the space. We worked hard to create an indoor/outdoor space which would allow the students a workspace that was undercover, yet outdoors and in a beautiful atmosphere. We created a living green wall to connect with nature and allow for a fresher feel in an urban environment. 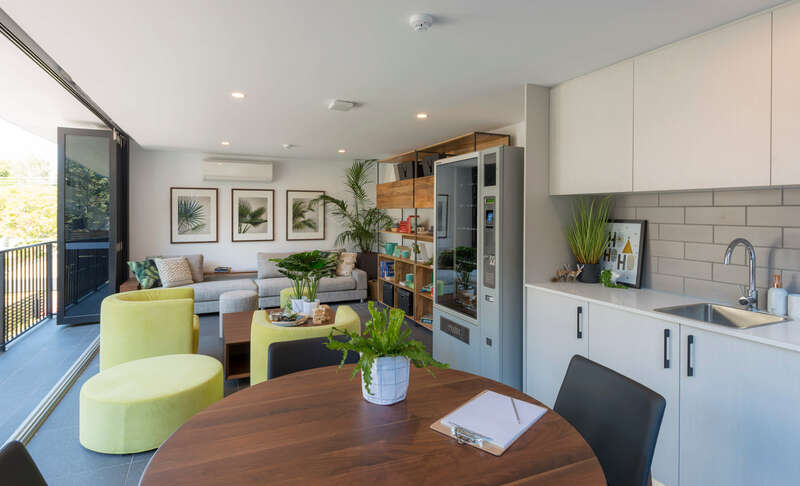 I created two distinct study and social zones in this space at Unilodge in Brisbane as I felt it was important to create spaces that were adaptable to changing study and social situations. I decided to use a mix of timber, natural linen and a pop of colour with the bright lime/yellow tub chairs and ottoman. 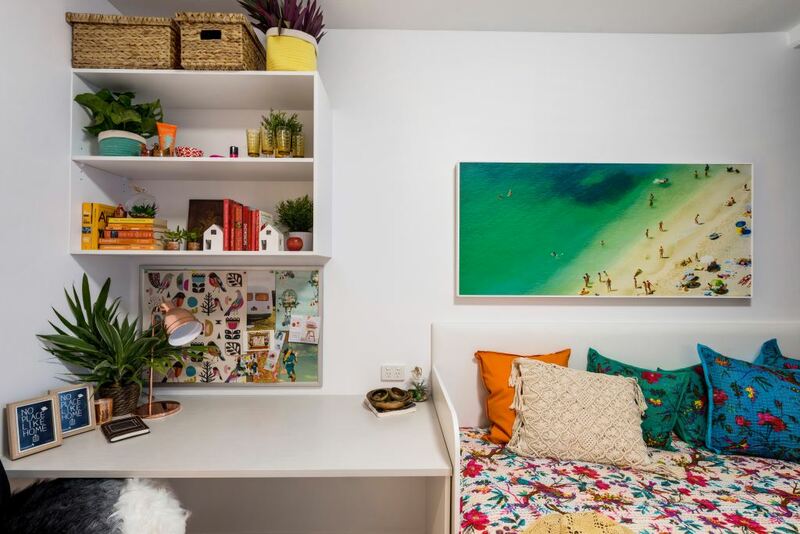 I felt it essential that we made the very best use of the small study space and added colour and vibrancy to a neutral palette. 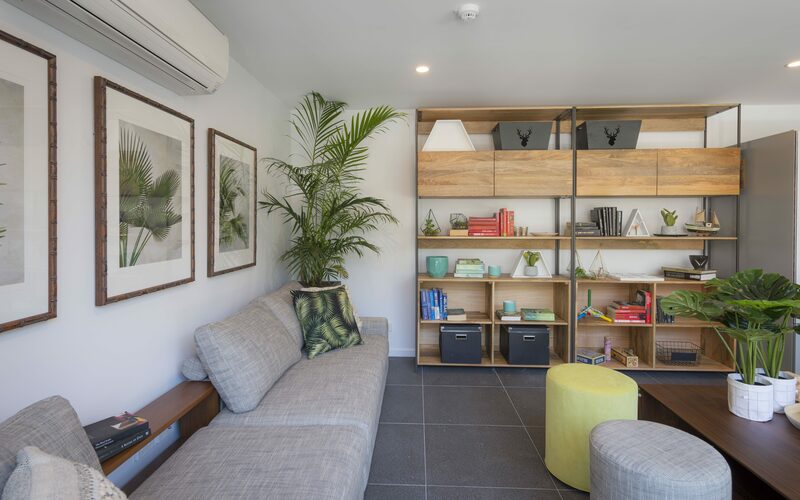 With the pops of colour in the Unilodge at Kelvin Grove, we knew it would add interest and entice students to set up home in this space. 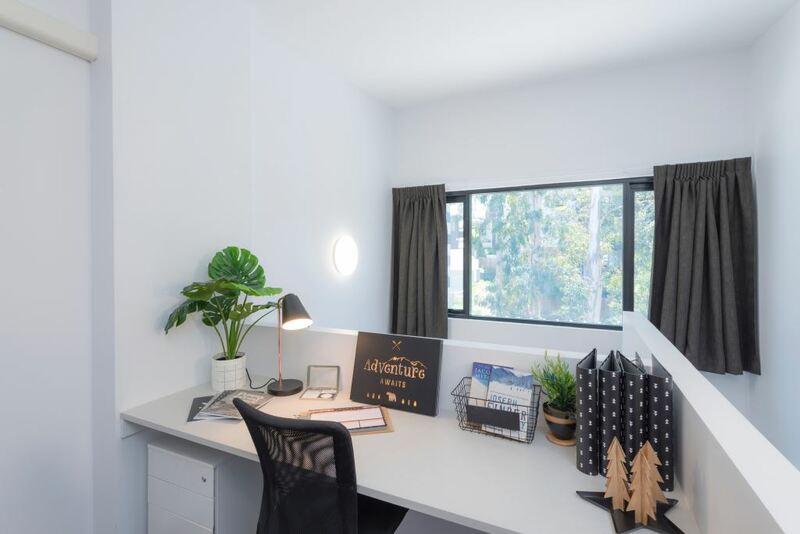 I decided to keep the colour palette simple in this workspace at Unilodge in Brisbane as I felt it was important to keep it simple and make the view out the window the feature.